No shameless self promotion today, Legion of Fans (LOF)... no, instead it's a bit of shameless cross promotion, for Pan Macmillan Australia's new author, Steven Horne. Steve's first novel, The Devil's Tears, set in East Timor, is in stores now and it is a cracking read. Steve's an ex Australian Army officer who has worked for a number of years as a military logistics contractor in Iraq and Afghanistan. We worked out, over a beer last year, that we were probably in Afghanistan at the same time, in 2002. 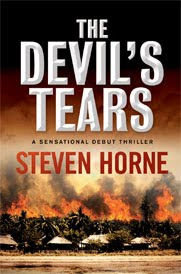 The Devil's Tears is the first novel that I'm aware of to be written by an Australian serviceman since our significant peace keeping operations in East Timor began in 1999. You'd think a book by an Aussie about Timor would be full of lantern-jawed Aussie soldiers, pretty NGO ladies, loyal natives and perhaps the odd hot or hunky helicopter pilot. Not so, this story. Instead, Steve's story focuses on the plight of a Timorese family torn asunder during the Indonesian military invasion of East Timor in 1975, following Portugal's relinquishing of its colonial possessions. The Devil's Tears looks at the long, bleak and terrifying years between 1975 and 1999 when thousands of locals died in a protraced guerilla war against the Indonesian occupiers. Steve's depictions of the long struggle for East Timor's independence are graphic and confronting and it seems as if the family will never be reunited. Interwoven is the story of an aussie journo and photographer who travel to East Timor in search of evidence of an horrendous massacre of civilians. The journo and photograher dodge evil security forces and treacherous traitors to bring the truth to the outside world (and there's a bit of unrequited funny business going on between the two of them, which makes a nice sub-plot). Steve is a fantastic writer and does an excellent job of combining boy-book action and chick-lit mushy stuff in this impressive debut novel. Even though it felt at times no one would survive this tragic story and the odds of a happy ending were perilously short, I was hooked from the first page and nearly missed my bus stop a couple of times while racing towards the conclusion. As well as turning out a top yarn Steve is also an all round good bloke, so I urge you all to go out and buy this book and check out his website here. We are still trying to get our hands on "Lords of the Pacific" by Grant Hyde, it is the same problem, we are experiencing with TP's books,which we hope will be sorted out with the new publisher. Great, will go check it out. Shall purchase a copy forthwith. Shant even wait till it gets to Kindle. The ANZAC diet... lose 20kg in six months.